My blog has passed a few milestones this March. I published my 500th post on Wednesday 7th March, passed 500,000 lifetime pageviews on Monday 12th March, and Tuesday 13th March was the second anniversary of my first post on my blog, though I'd obviously written quite a few header posts around the blogosphere before then. 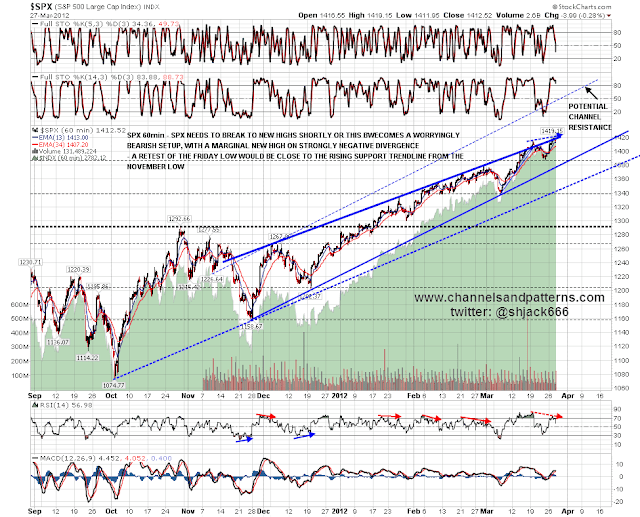 Blog traffic has been increasing steadily in what is almost a perfect rising channel over the last two years, with the last retracement after I smashed my lower leg (top and bottom) at the end of May last year. 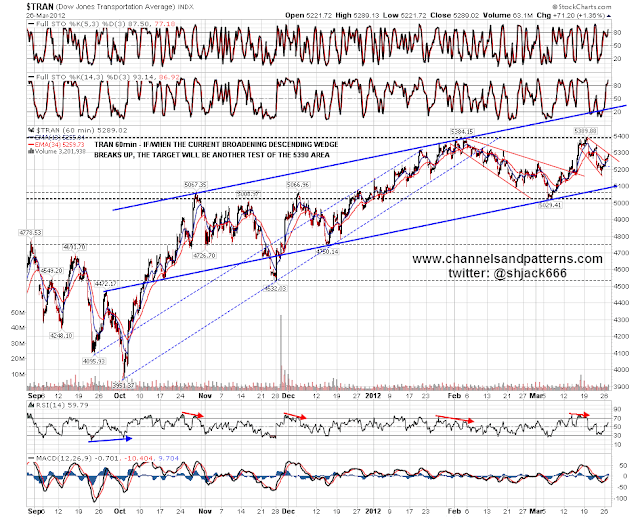 Interestingly I'm now hitting channel resistance again, so I'll be watching for either a breakout or a retracement into channel support here, and taking care to avoid slippery surfaces. I started writing header posts to indulge my liking for writing and charting mainly, and didn't really give any thought to whether that might ever become more than an enjoyable hobby but, with a real prospect of passing a million pageviews by the end of this year, I've been giving a little thought to where this blog is going in recent months, and while my thoughts there are still evolving, I have started to make some changes to the blog to put it on a more professional footing. What I have done so far this year is to take the www.channelsandpatterns.com domain name and to experiment with advertising. After an initial unsuccessful attempt to build a working relationship with the software at Google Adwords, I have gone with a different advertising company using humans to interact with customers, and their decent quality financial ads should be starting to appear on my blog over the next few weeks. I've also set up an Amazon link for people to buy from Amazon via that link, and will be setting up an Amazon shopping site as and when I have time. Obviously I've changed the format of the blog extensively over the couple of weeks, and that's gone pretty well, and is much more flexible than the old format I was using. I'll probably get a logo done too, though I like the modified title I did a few days ago, and might yet just adapt that into a logo and banner. I hope everyone likes the changes and the feedback has been almost all positive so far. 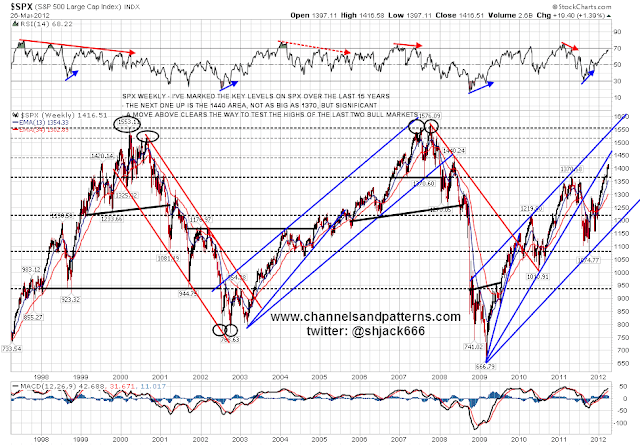 I've also changed my twitter handle from shjack666 to shjackcharts tonight, as my wife suggested that many non-chartists might miss that 666 was the SPX low in March 2009. I have a provisional overall scenario for the next month or two that I'm expecting to play out. Obviously I may be mistaken, but it hangs together fairly well. 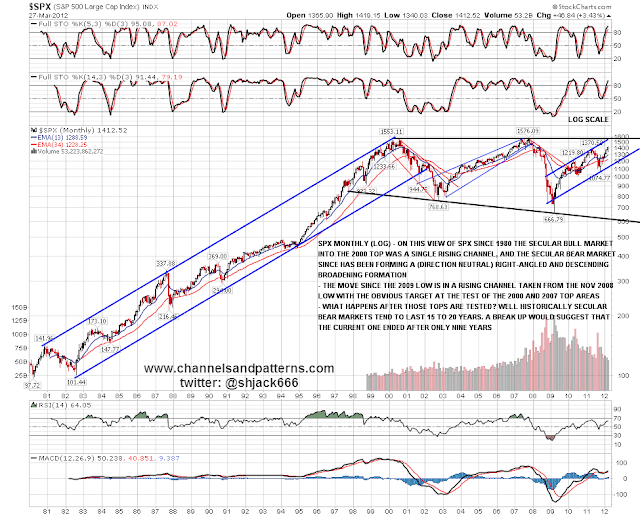 On equities I think we are in a sideways type wave 4, which will be followed by a wave 5 up that will probably peak at a major pivot, either at 1442 SPX or slightly north of 1500. 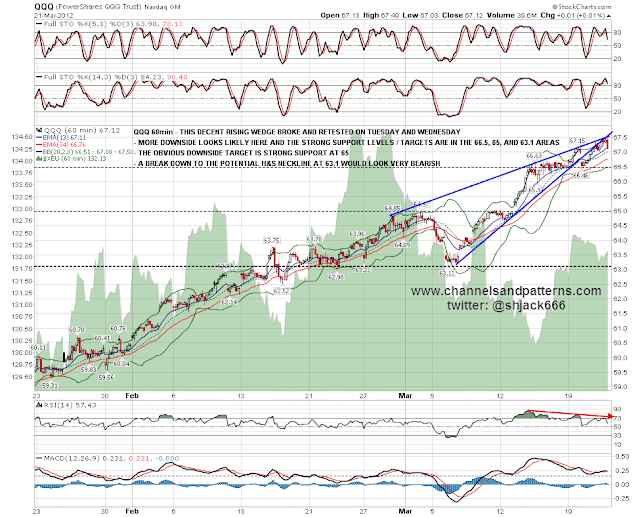 Given the proximity of 1442 SPX to where we are now there's a better argument for the higher target I think. 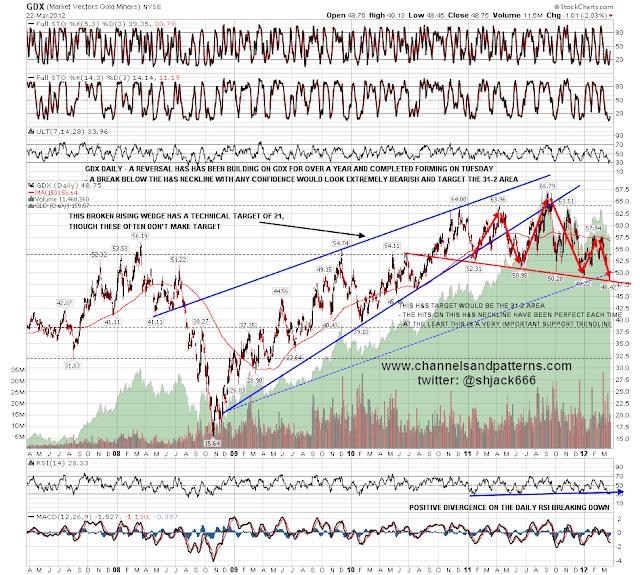 That should take us into the seasonal high area late April to sometime in May. After that I'm expecting a big correction over the summer and we'll see what the bears can do with that, if any have survived this monster move up. While that plays out I would expect new rally highs on EURUSD, and a major drop in bonds. As long as USD can hold uptrend support during that time, I then have a hugely bullish overall setup on USD that could see it spike up to over 90 while EURUSD gets crushed over months following. 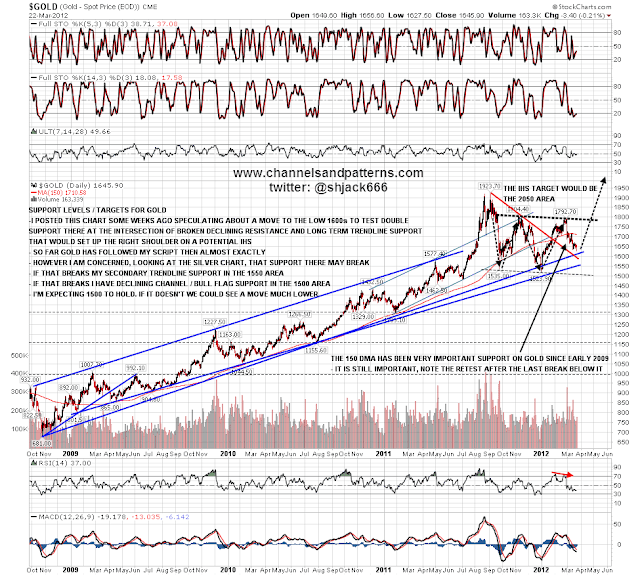 I don't have time to show them here but I've been looking for a bottoming pattern to develop on gold and silver here as the PM complex has tested important support, and there are part-formed IHS patterns on both gold and silver which look provisionally bullish. I'll be posting those on twitter when I have time later and my twitter handle is shjack666. I have a twitter related question to ask today and it is this. I use 666 on my email and twitter handle because it was the 2009 low on SPX. Obviously the number has some religious connotations however, and my wife has suggested that I should change this for that reason. Feedback welcome and I have already identified a decent alternative. The outlook for today is fairly neutral statistically, with a slight downward bias on SPX and Dow, and a slight upward bias on RUT. If SPX can make a short term higher high at the open I'll be looking for a further run up for a few points before another probable move down. into early next week. 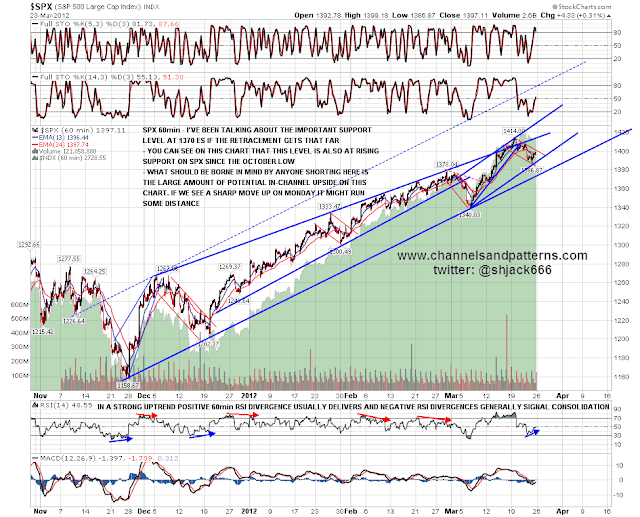 I'll be watching that SPX 15min chart for a short term high signal. I'll be in and out today. The next couple of days are very important from a technical perspective, and the bulls need a move up to new highs soon if we are indeed still in a strong uptrend. On the bull side it is Thursday today, the most bullish day of the week since October, the low yesterday saw a touch of rising support from October on the Dow, which is the key equity support trendline here, the EURUSD IHS has been retested and is still very much in play, and there are some signs that this rally in bonds may be petering out. 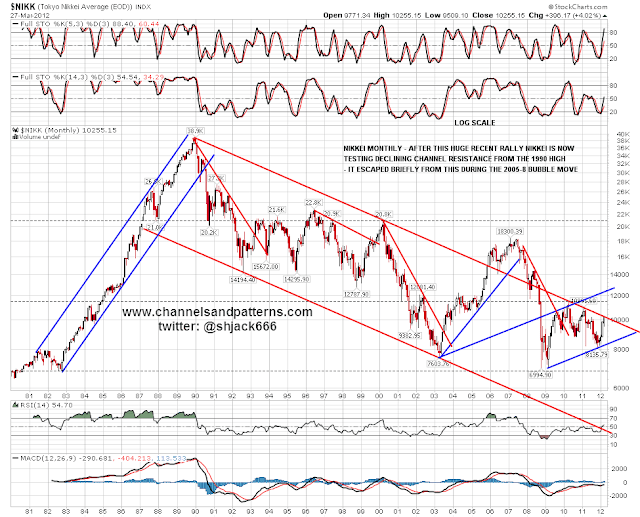 This is a potentially very strongly bullish setup for equities. If we see a move below yesterday's low that breaks that strong support trendline on the Dow, it would be a major technical sign of weakness. It wouldn't mean that the top is in, and I would still favor a further move to test the 1442 SPX pivot, but it would suggest strongly that the current move up on equities would fail there. 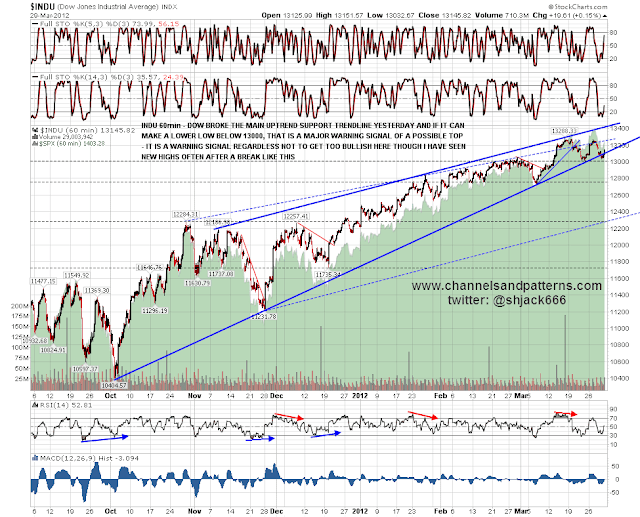 If we do see further weakness then I see strong support for SPX in the 1387 area near Friday's lows. A break much below would look very weak and clear the way for a deeper retracement over the next few days. The bulls need to perform today. There have only been four instances so far in 2012 of two consecutive red daily closes, and all of those were during consolidation or retracement periods. Historically the end of March has tended to be weak however. 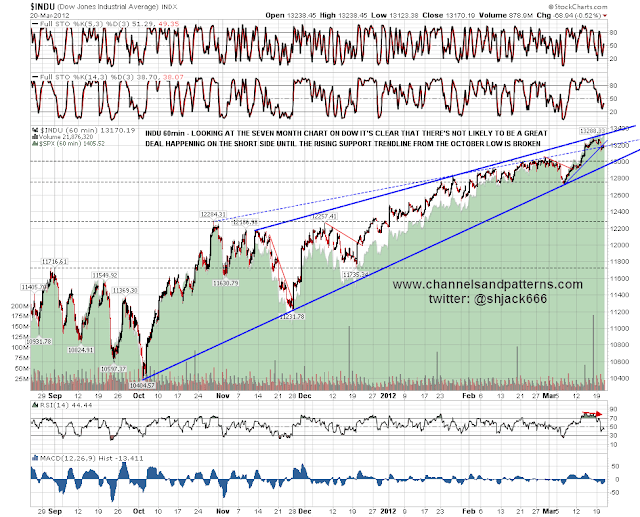 I'm watching the 1409 SPX area for short term support and then 1400 if that breaks. If it does I would expect a test of Friday's lows. 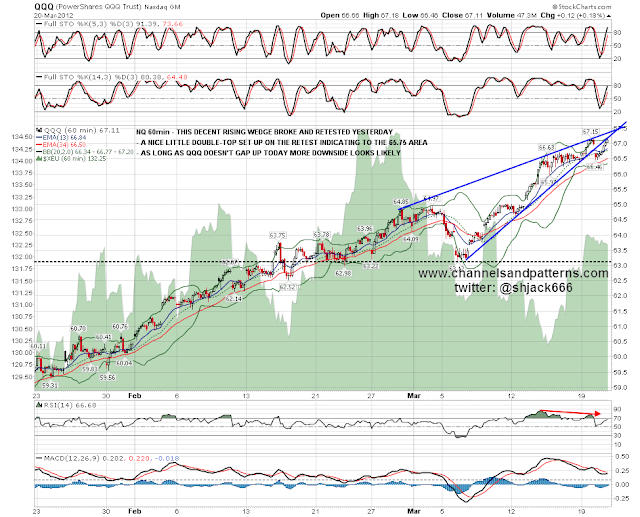 On the upside 1442 is the next obvious target and a strong resistance level. 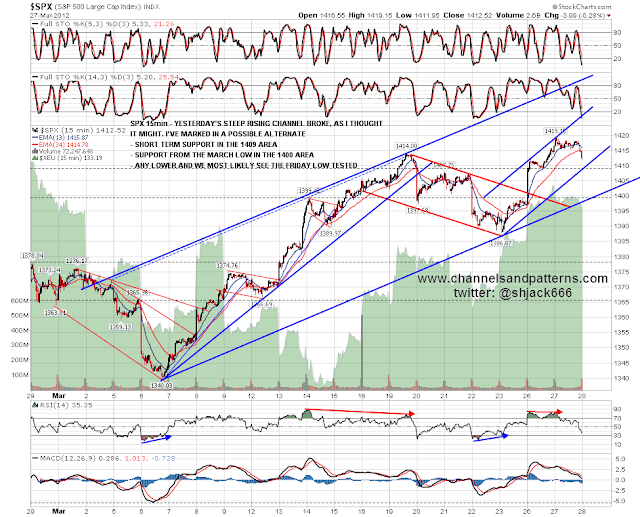 Yesterday was a trend day so the odds today favor a consolidation or retracement. The odds also slightly favor a higher close than yesterday's close. The gap fill odds are good. Any low on SPX under the 1395-1400 area would be unexpected and suggest that we have not yet finished the consolidation of the last few days. 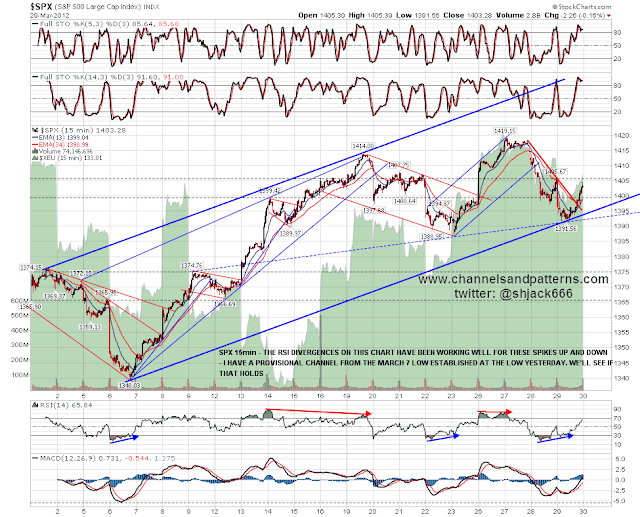 I would provisionally expect early weakness, a low in the first hour or so, and then strength for the rest of the day. 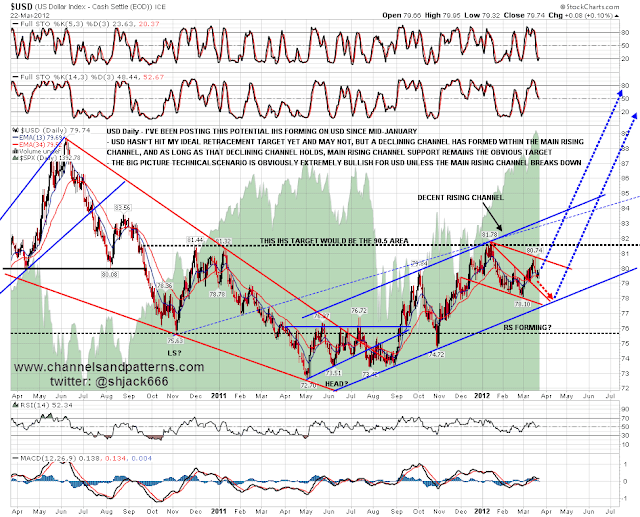 Last chart for today is a chart of USDJPY, which is the inverted Yen chart. I've said a few times that the prospects for Yen and Japanese bonds look extremely grim over the next few years, with Japanese government debt to GDP at over 200% and one in three yen spent by the Japanese government still being borrowed. How on earth has Japan managed this dark miracle of debt accumulation? Well in large part they managed it by taking over the huge personal savings in their Post Office system and spending it, leaving a very dubious IOU in its place. As Japan is obviously the pioneer of current economic policies in the western world that is an example worth noting, especially as we see governments plunder the private pension systems by forcing them to buy very long dated government bonds at the current centrally planned very low interest rates. 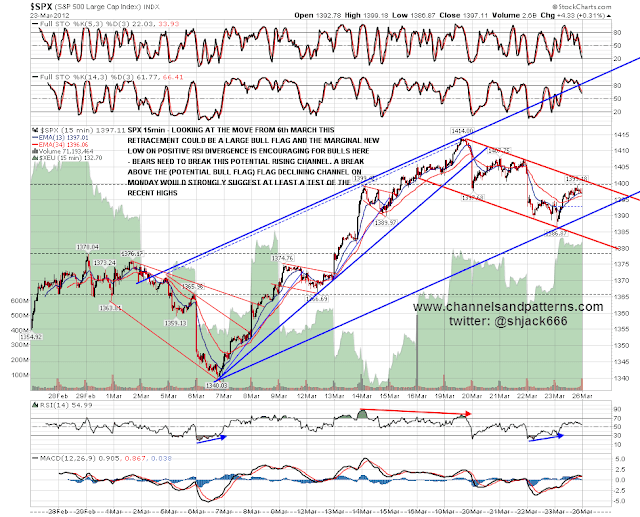 The overnight action on ES looks bullish, and declining resistance from the high at 1400.75 has been broken. I'm expecting at least a hit of SPX declining resistance just over 1400 today and if ES can hold the current levels into the open then that would be a clear gap over that resistance. 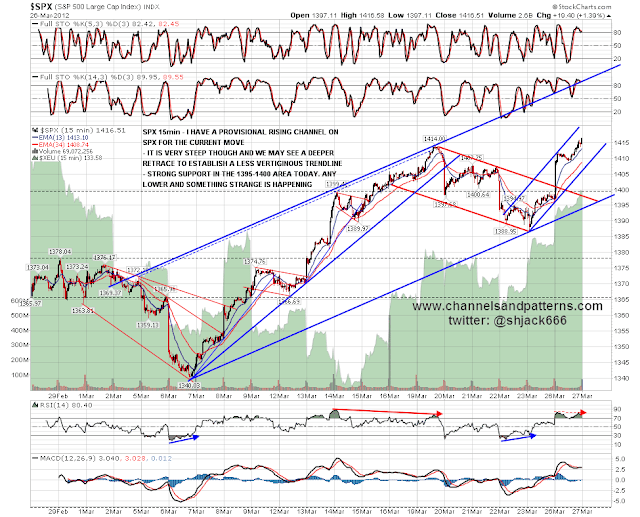 In the event that SPX reverses at resistance at the open then downside targets today would be in the 1390 and 1380-5 areas. There is always a conflict when you see short term patterns for during trading hours on both an index and its 24 hour futures equivalent. An H&S pattern completed the head on SPX and ES yesterday, and there was a clear short term double bottom on both at the lows yesterday. 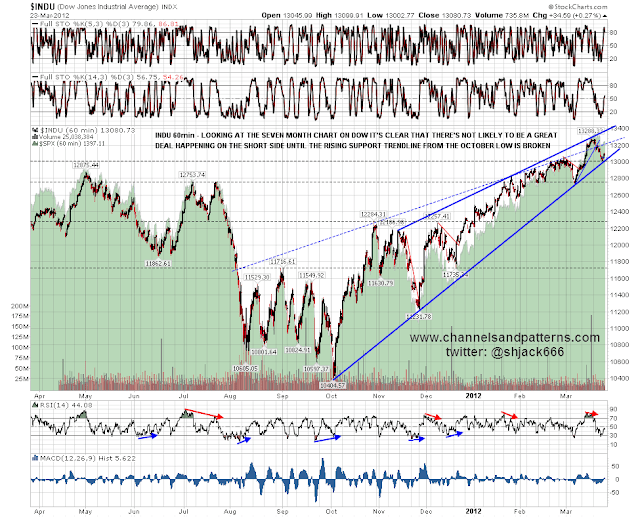 On ES overnight that double-bottom has played out to target, and the H&S is now largely formed. 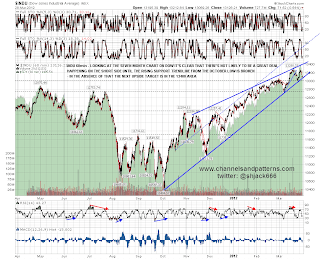 Where does that leave these patterns on SPX? It may be that we will see that right shoulder bounce on SPX this morning, as a sort of echo of the overnight ES move, but for the moment I would treat the ES move as completion of that double bottom, and disregard the setup on SPX. We'll see how that develops this morning. Overall I'm leaning cautiously bearish on equities today, but I'm watching carefully to see whether overhead resistance on ES and EURUSD is broken, and whether support on ZB holds. I'm still of the view that this is a counter-trend reversal, and it looks fragile this morning. We need to see a definite move down to confirm the bear scenario, and that should be as early as possible in trading hours today. If we are going to see a break down then Friday is the most bearish day of the week since October and the best day to see that. If we don't see that break down today, then yesterday's low could hold for weeks, and I would be watching declining resistance on ES from the high to signal a possible bullish break up. I'll be out for most of the session today. I've added a column on the left to my blog overnight and widened the page. 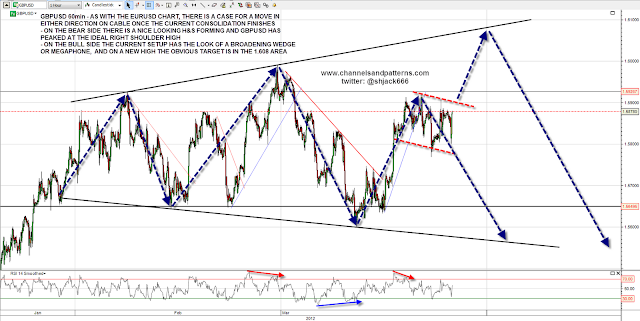 Please have a look and tell me if you think that it is now too wide. I had a few requests for larger charts yesterday, but I've reached the maximum size that the site template will allow. If you click on any chart however, you will link through to the full size version at screencast, and you can click on that again to enlarge it further. 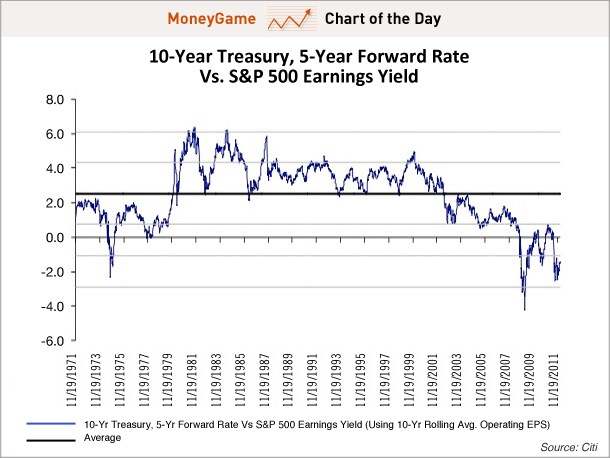 The last chart today has been the subject of much excited commentary over the last couple of weeks, and that is the long term comparison chart between bond and equity yields, with the bullish implications for equities of a reversion to the mean on this chart. This is one of the main reasons for the very bullish forecast by Goldman Sachs this week. Yes ..... but. This rather brings to mind the monetarist experiments in the 1980s. The correlation between the money supply, inflation and output became briefly fashionable then, and policymakers in the UK and US started targeting monetary levels, rather than interest rates, as a tool for controlling the economy. What they then discovered was that the correlations that had been stable until then, became unstable as soon as they tried to control the money supply directly. Clearly bond yields are being centrally planned at the moment to a very large degree and this past correlation is therefore somewhat doubtful as a predictive tool. I'm not saying that the correlation will vanish, but there has to be a significant possibility here that it will. The other thing to mention is that the obvious example of similar policies being tried over a long period is in Japan over most of the last two decades. There are two points worth noting there. Firstly the policy in Japan has entirely failed to deliver either stock market rises or growth, with the Japanese economy in a two decade depression and the current stock market value, after a huge rally, slightly less than 75% below the 1990 high. The second point is that even after twenty years of almost uninterrupted failure, policymakers there have yet to seriously consider abandoning this policy, which is something to consider. Anyone still clinging to the hope that the Fed policymakers have good forecasting skills should really read this article here. It might be that the events of the last few years have sharpened them up a bit, but it's worth noting that, as with Japan, the response to the crisis they blindly created in the run up to 2007-9 has been to massively expand on the same policies that led to that crisis. I'm leaning short today and and rallies should be sold unless we see a break over 1398 ES. Strong resistance in the 1393.5-5 ES area will most likely hold today. I've updated my blog format overnight and any feedback on the changes is welcome. Among other changes I widened the page and enlarged the text and charts. I am thinking of widening the view further and would appreciate any feedback from those for whom that might be an issue. That change wouldn't affect the mobile format though. I had mixed feelings about the action yesterday and overnight from a directional perspective. On the bull side the early low and grind up yesterday was a classic strong uptrend day and NDX recovered from the gap down to make a new high. On the bear side ES delivered a lower low, the down gap on SPX didn't fill yesterday, and we saw a perfect test of broken ES rising support overnight without a higher high there as yet. 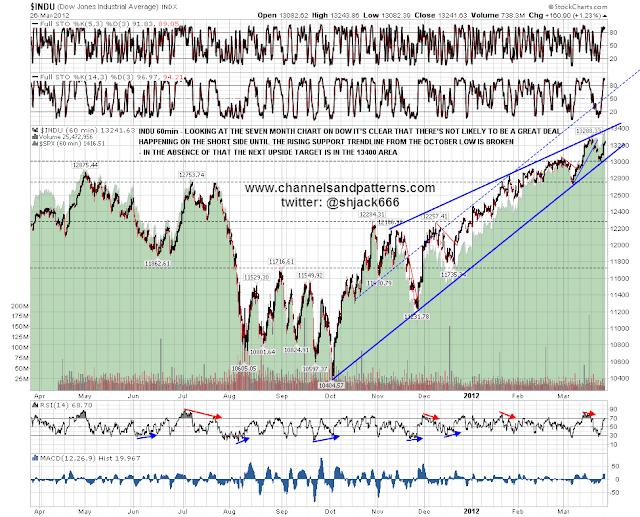 Overall I'm cautiously bearish today as long as we don't see a new high on SPX. 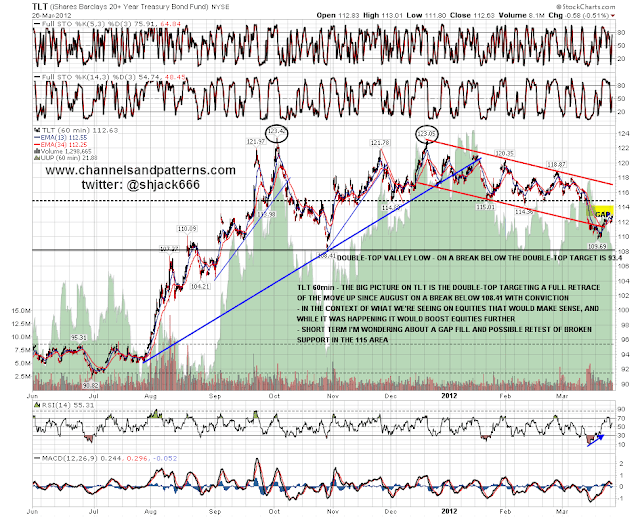 Overall on equities and EURUSD today I am leaning short, and on bonds I am leaning long. As I mentioned however these all look like short term counter-trend retracements to me over a likely timescale of a few days at most. If we start to see major trendlines break on equities, or a lower low on EURUSD, I might need to change that view but until then the overall trend is intact. I've been trying and mostly failing to get these posts out over an hour before the open over the last few days, and that's because the clocks changed in the US the weekend before last, and the clocks in the UK did not. The clocks change in the UK this weekend so the posts should be earlier again next week.